Helen Grogan and Yumiko Hata (METI) at the NEA Symposium reception where attendees sampled a range of produce from the Fukushima region. 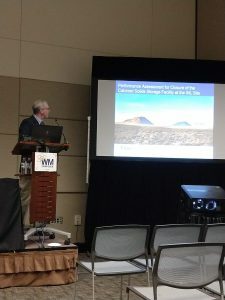 RAC was invited to make a presentation at the Nuclear Energy Agency (NEA) International Symposium on Decommissioning, Reconstruction, Rehabilitation, and Food Safety: Rebuilding Post-Accident Confidence. 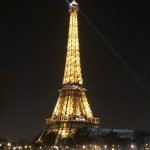 The Symposium took place at the OECD (Organisation for Economic Co-operation and Development) Headquarters in Paris, France, on Tuesday 26 March, 2019, in collaboration with co‑organizers: Ministry of Economy, Trade and Industry (METI) and the Ministry of Agriculture, Forestry and Fisheries (MAFF), Japan. 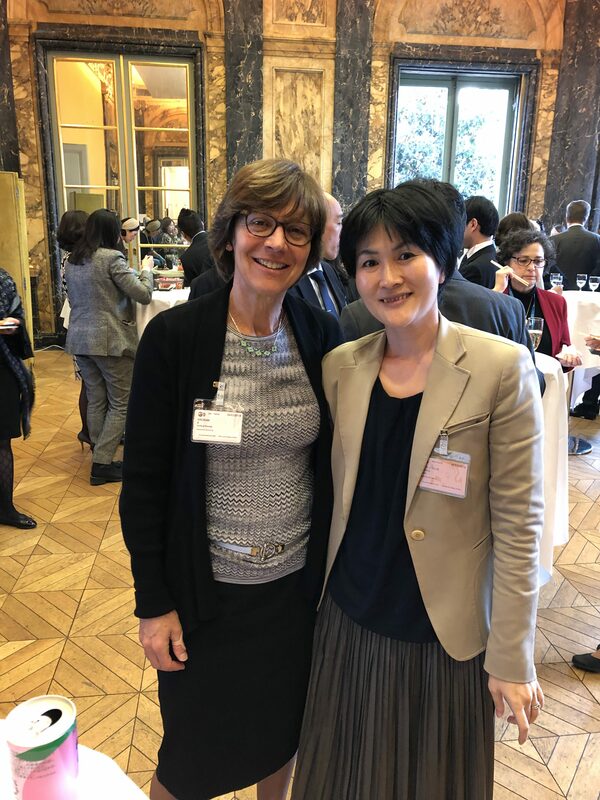 Naohiko Yokoshima, Director of the Export Promotion Division in the Food Industry Bureau of MAFF (pictured above), was one of the sponsors of the meeting and presented at the Symposium regarding the post-accident food-safety management status and national food-safety experience. 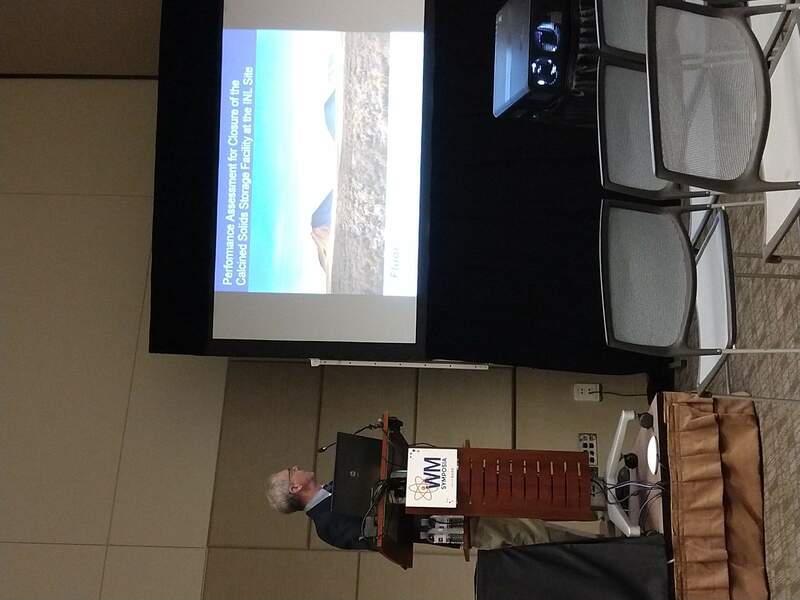 Art Rood, Colby Mangini, and Emily Caffrey attended the 2019 Waste Management (WM) Symposia in Phoenix, AZ from March 3-7. 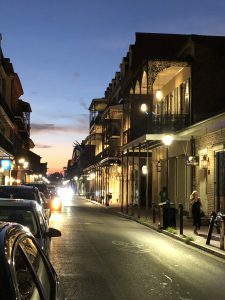 The WM Symposia is the world’s largest and most prestigious conference on radioactive waste management & disposal, decommissioning, packaging & transportation, facility siting, and site remediation. 2019 was its largest year to date, with about 2,300 attendees! 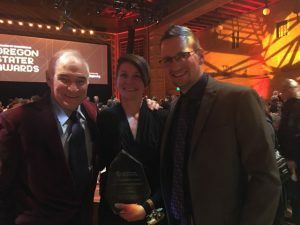 Emily Caffrey was among the honorees at the 2019 College of Engineering Oregon Stater Awards on February 21, 2019, at Oregon State University (OSU). The OSU alumni honored at this event were the Hall of Fame honoree, Robert Yüksel Yildirim, five inductees into the Academy of Distinguished Engineers, and ten new members of the Council of Outstanding Early Career Engineers. Emily was recognized among the Council of Outstanding Early Career Engineers, reserved for Oregon Staters with fewer than 20 years of professional experience whose contributions have distinguished them as future leaders in their field or profession. John Till, Emily Caffrey, and her husband Jarvis at the 2019 Oregon Stater Awards ceremony. Emily earned her B.S. in Nuclear Engineering in 2010, her M.S. in Radiation Health Physics in 2012, and her Ph.D. in Radiation Health Physics in 2016, all from OSU. She’s been a valuable member of the RAC team since 2016. Emily currently serves as president of the Alabama chapter of the Health Physics Society and is also an adjunct professor at both OSU and the University of Alabama- Birmingham (UAB). 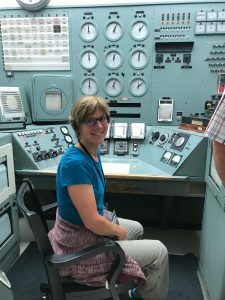 RAC team members Helen Grogan (shown in photo below in control room) and Mark Packard recently toured the Hanford Site B Reactor National Historic Landmark while visiting the site for a project meeting. RAC team’s Helen Grogan (in photo) and Mark Packard take a break from project work with a tour of the Hanford Site, B Reactor National Historic Landmark. As part of the Manhattan Project National Historical Park, and in partnership with the National Park Service, the Department of Energy has offered free public tours of the B Reactor since 2009. In the photo at top of the Hanford Site B Area from World War II, B Reactor can be seen between the water towers on the right side of the photo, along with other facilities that supported reactor operations. The B Reactor was the world’s first full-scale plutonium production reactor. Operations began in September 1944; the reactor was shut down from 1946-1948, and then went back into service until 1968. Emily Caffrey was selected by Health Physics Society (HPS) President Nolan Hertel to join the HPS Public Information Committee. The Public Information Committee is responsible for gathering, organizing, and presenting information within the Society’s objectives; responding to requests of the president, and others, for presentation of this information to laypersons, governmental organizations, and individuals and to other scientific and technical organizations; and facilitating dissemination of accurate and unbiased information with regard to ionizing radiation by preparing educational materials and other activities as suggested and/or approved by the Board of Directors. Emily’s primary initiative is to help develop short YouTube videos responding to the most commonly asked radiation-related questions. Helen Grogan recently served as one of the U.S. delegates to the 65th session of the United Nations Scientific Committee on the Effects of Atomic Radiation (UNSCEAR) in Vienna, Austria, from June 11-14, 2018. This is Helen’s fifth year serving on UNSCEAR. The 2018 UNSCEAR delegates for the U.S. pictured above (L to R) are Bruce Napier, Helen Grogan, Vincent Holahan, Wesley Bolch, Gayle Woloschak, David Pawel, Armin Ansari. “Over 150 scientists from 27 State Members of the Committee, four observer countries and nine observer organizations advanced the work of its scientific reports on selected evaluations of health effects and of risk inference due to radiation exposure, on lung cancer from exposure to radon, and on biological mechanisms influencing health effects from low-dose radiation exposure. The Committee also discussed its scientific evaluation of levels and trends of exposures of patients and workers to ionizing radiation. The UNSCEAR secretariat is currently running two global surveys on medical and occupational exposure. These surveys are being conducted in cooperation with the International Atomic Energy Agency, the International Labour Organization and the World Health Organization. The Committee also agreed to establish an adhoc working group to develop its future programme of work on the effects of radiation exposure. Helen Grogan recently served as one of the U.S. delegates to the 64th session of the United Nations Scientific Committee on the Effects of Atomic Radiation (UNSCEAR) in Vienna, Austria, from May 29 to June 2, 2017. This is Helen’s fourth year serving on UNSCEAR. The 2017 UNSCEAR delegates for the U.S. pictured above (L to R) are Naomi Harley, Gayle Woloschak, Bruce Napier, Wesley Bolch, Vince Holahan, Helen Grogan, David Pawel, and Armin Ansari. 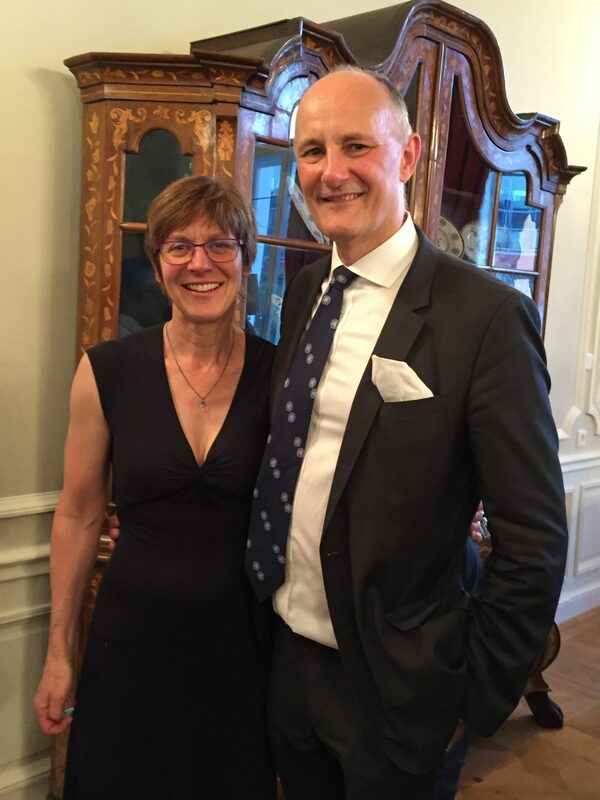 During a reception hosted by Belgian Ambassador, UNSCEAR secretary Malcolm Crick announced his retirement, to be effective November 2017. RAC is pleased to announce that Dr. Colby Mangini joined the RAC team in May 2017. Colby is a Certified Health Physicist (CHP) with a diverse background in applied health physics and computational health physics. He began his career in the U.S. Navy, where he taught at the Navy’s Nuclear Power School (NPS), and completed his Masters in Health Physics at Oregon State University (OSU). After the Navy, Colby earned his Ph.D. in Radiation Health Physics at OSU, where he was also an instructor. Since completing his Ph.D. in 2012, he has held positions as a principal scientist at Knolls Atomic Power Laboratory and as Radiation Safety Officer at St. Jude Children’s Research Hospital. 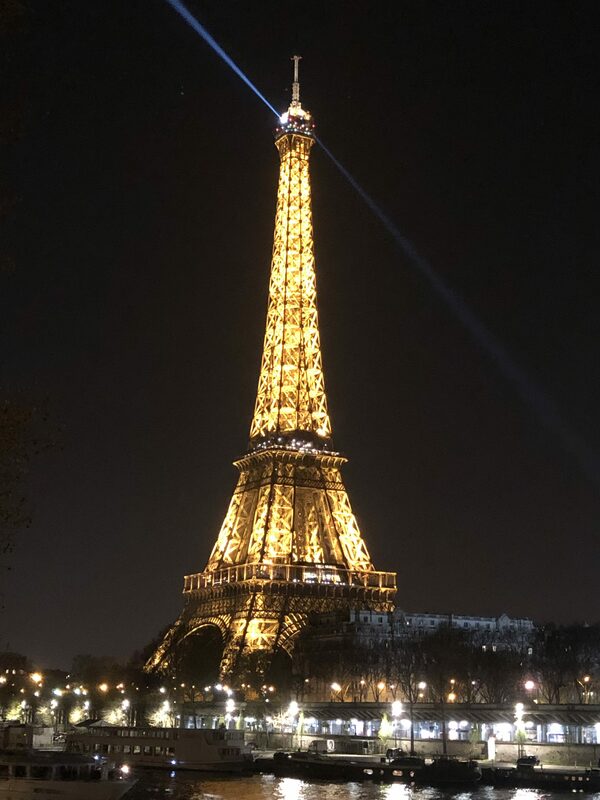 Colby will assist the RAC team in radioactive contaminant transport modeling, dose reconstruction, and other areas of environmental risk assessment. He has already provided valuable support on several projects, including helping to present RAC’s most recent training course for the Nuclear Regulatory Commission (NRC) and performing QA/QC review of computer code used for calculating radiation dose. RAC presented a 5-day training course on environmental risk assessment for the Nuclear Regulatory Commission (NRC) from May 8 through 12, 2017, at the NRC Professional Development Center in Rockville, MD. John Till, Helen Grogan, Pete Shanahan, Art Rood, Emily Caffrey, and Colby Mangini presented lectures and case studies during the week. The course was designed to allow participants to use their acquired knowledge to complete performance evaluations of licensee environmental assessments, perform environmental impact reviews, inspect licensee programs, and manage environmental projects. RAC has presented a similar training course for the NRC twice previously and is contracted to present up to two more courses for the NRC through 2019.